2-Storeyed Cape Cod Style House. Very Large. Delightful setting. Very quiet at the end of a cul-de-sac. Surrounded by farm land on 3 sides with cattle grazing. Large outdoor areas for ball games, etc. Plenty of parking area for cars and boats, etc. Aproximately 40metres from nearest house. 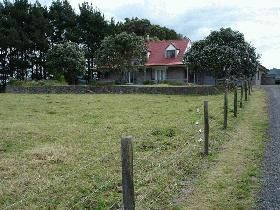 Very nice views out to farmland and hills on one side and views of the sea from the top storey. Wood burner heats the whole house really quickly [if required in winter]. Ideal for well trained dogs. Full time tenant in flat behind garage - completely separate from house. Colleen is very quiet but please respect her privacy. Minimum 4 day stay over shoulder period, 4 days for low period and 10 day stay over Christmas period from 20 December to 10 January. Great spacious house in a fantastic private setting. Great weekend away. Great relaxing weekend. We would definitely stay here again if available. Spacious, older house in quiet rural setting. Spacious, older house in quiet rural setting. Few maintenance issues which owner says he will fix. The house is very cosy and private. The house is very cosy and private. Highly recommend this place. Thank you for letting us stay there.